Living in a small suburban area near Idaho Falls, we live in a place called Shelley, Idaho. The problem I am getting to, right away here, is that internet is a huge issue in small towns like Shelley, Idaho. We can’t get the nicest internet connections, unless we are able to pay the same amount as you would for a car payment, or more depending on the car, to have good internet. So, we settle for crummy internet and connections due to it. There is definitely one thing you don’t want bad, crummy internet connections for. That is playing any type of online game. Online gaming is the popular gaming style in today’s video game playing. Here at work, at The Group Real Estate, we talk about gaming, the online gaming we love, and some indulge in the online game, League of Legends. I, myself, prefer single player, story driven games now. I like the story lines, and if it feels as though I am playing a movie or my favorite comic book characters, I love the accomplishment of doing things on my own, progressing, etc. I also like that I can progress on my own, I can move through the story on my own, and I don’t have to try and be on the game for 24 hours a day. Competition is great, but when it is behind a screen and a controller, the true merits of competition are dumped. This is something that you don’t have to worry about in a single player game, as you are in competition with yourself and with the ideals of the game. However, Star Wars has always had such a special spot in my heart, so when a Star Wars game comes out, single player or multiplayer, I feel as though I need to get it. 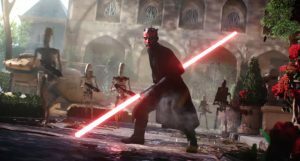 The highly anticipated Star Wars Battlefront II had an open Beta this past weekend. Now, the best way to go about doing very well in this game, is, first off, playing the entire time the Beta is open, for those of you who don’t have any sort of lives, and second, making sure you have an amazing internet connection. The speed will cause a huge issues, good or bad, for you as you play online. If you want to have faster load times, quicker game play, and not have to worry about lag, or small time glitches happening to where you have to reset the gaming system, then you are going to be paying an inane amount for your internet. This also leads me to the idea of staying on these types of games for far too long. One part of these online games, is you need to spend a stupid amount of time playing the game and honing the skills to be better. This time frame then lends itself to getting upgrades, getting better weapons, developing better skills, etc. So, as a big Star Wars fan, I want to be able to play the game, in a fun manner, usually with my pal who loves Star Wars as much as I do. This fun nostalgia type feeling gets derailed when playing a beta like this. The first few hours you play are great. You are on the same level as the world. However, if you have kids, if you have jobs, if you have a life away from the Xbox, you will soon be bumped down the level ladder. When you come back to the game, wanting to have some nerd fun, it isn’t quite as fun as it was before. This down slide happens as you come back more and more, but aren’t on there for the entirety of the www. 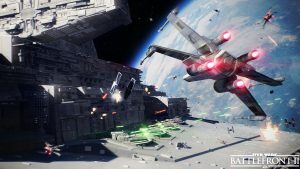 All in all, I enjoy the game and I love the idea that I will get to play as the characters I love, like Han Solo, Darth Maul or Rey, but with the same crummy internet and the ability to play 6 hours a week instead of 40 hours a week, I am not sure how much longer I will be able to let the nostalgia of Star Wars take hold as I play Battlefront II.